Researchers from China’s Fujian Normal University have created an easy-to-make ‘rewritable’ paper that can be drawn or printed on any number of times. According to a report published in ACS Applied Materials & Interfaces, written messages can last more than half a year, unlike other rewritable papers whose messages fade after a few days or a few months. Several research groups have been pursuing different development strategies to create rewritable paper, but most of these come with drawbacks. For instance, they follow complex fabrication techniques and chemistries that relies on ultraviolet light to erase the writing, or are constantly in need of energy to maintain the document. To overcome these limitations, Fujian’s Luzhuo Chen and colleagues developed a simple method for making long-lasting rewritable paper that can be wiped clean simply by changing the temperature. According to the researchers, the new material consist of three layers in a sandwich-like structure. 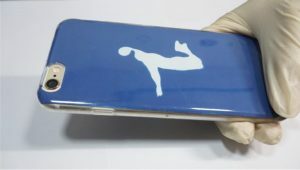 Luzhuo’s team painted one side of a piece of paper with a blue dye that becomes colorless upon heating. They then coated the other side of the paper with a black toner layer that produces heat upon excitation with light. Using a ‘pen’ that applies heat, a thermal printer or a source of near-infrared light, the team created images and words that remained legible for more than six months. They also produced a rewritable cell phone case. To reset the paper, the researchers had to just cool it down to 14 degrees Fahrenheit. Luzhuo contends that this process can be repeated more than 100 times.